The email marketing solution with a step by step guide to create professional electronic direct mailers. No technical knowledge is required. All-in-one platform with email marketing, form creation and database management functions. Unsubscribed, failed and bounced emails are updated automatically. Send scheduled follow-up replies / emails upon customer’s enquiry or even birthday greetings for every customer. Select your design template or upload your own HTML. Create or select from pre-created form templates. 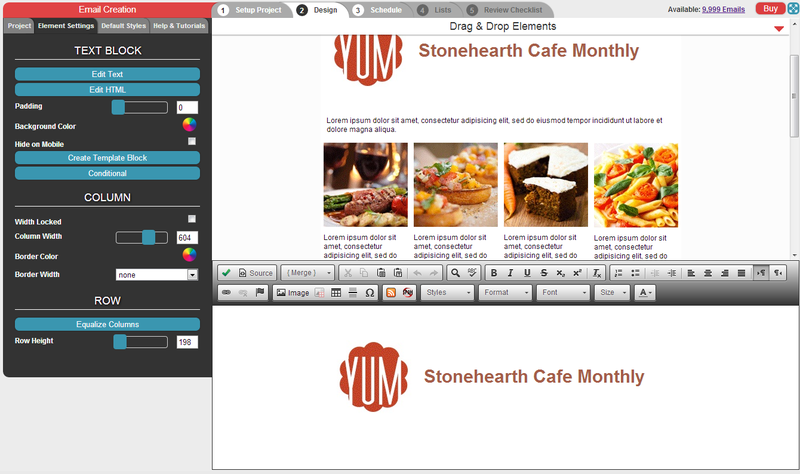 Embed forms into your websites, including websites created using Web Builder or eShop Builder. Form types include subscribe forms, event registration forms, sales contact forms, surveys and more. Respond to customers even when you are not at your desk. Schedule replies to be sent when customer responds. For example, set up the system to send a series of follow up messages to a subscriber as soon as they sign up on your website. Another example is sending birthday greetings to your customers. Upload and organise your lists easily. List is updated with removal of unsubscribed, bounced or failed emails after each broadcast. System is able to detect duplicate email addresses and will send the email one time in the same campaign. No need to pay third parties to design and send your emails. Email campaigns, forms and contact lists can be created easily with a step-by-step wizard, with no programming required. Complies with industry best practices and helps prevent your email being treated as spam. With smart contact list management, you can be assured of quality leads, cost optimisation and higher success in your marketing activities. This integrated marketing tool allows you to create, send, track and even respond to your customers effortlessly. Allows you to plan and manage your communications by creating the autoresponder workflow visually. All offers for this app include a 1-month contract. Unused credits will not be rolled over to the following month. Credits will be reset based on the day of purchase. For example, if you purchase the pack on 15 June, the credits will be reset on 15 July. Unused number of contacts will not be rolled over to the following month. For example, you purchase the 1,000-contact pack on 15 June and utilise 800 contacts on 14 July. By 15 July, the number of contacts is reset to 1,000. Note: Credits usage validity period is aligned with basic pack's reset credits period. For example: if you purchase the top-up on 14 July but the monthly reset date for the basic credit pack is 15 July, you have only 1 day to use this top-up pack. SimplyCast eMarketing is an all-in-one email marketing suite that allows users to create and broadcast important information to clients or contacts, as well as store and collect contact data. How does SimplyCast eMarketing work? SimplyCast eMarketing allows you to broadcast your email campaigns. While doing so, you can collect subscribers’ data with opt-in forms. These forms can be customised for your websites and all subscribers will be collected and stored into a centralised contact list management with the system. In addition, the system allows you to manage and plan automatic follow up responses to subscribers when they submit using the form. How does the Personal Data Protection Act 2012 (PDPA) affect me if I sign up for SimplyCast eMarketing? PDPA and other Privacy/SPAM control regulations are to be complied as they prescribe regulatory requirements. SimplyCast eMarketing helps you to avoid the concerns and comply with these regulations by adopting the industry’s best practices. All campaigns will be subjected to be reviews to help ensure in compliance with the policy. How many users can I assign? You can assign up to 5 users. You can do so in the myBusiness Login dashboard. Which browsers should I use to access SimplyCast eMarketing? You can use the latest verson of FireFox or Google Chrome to access SimplyCast eMarketing. Is there any API for me to integrate my contacts from other systems? Yes, there is a API available that you can use with the List Management application. The API will allow you to synchronise your database from other systems into SimplyCast eMarketing. To find out more, please click here. We treat your data as assets that must be protected against loss and unauthorized access. We employ information security techniques to protect your information from unauthorized access. Access to your information is limited to designated authorized agents who have a legitimate business need for that information. All our servers are housed in secured data centers with 24/7 monitoring. Is there any email template I can use for email campaign? Yes, there are pre-created professional templates that are available in the system. Can I import my own HTML? Yes, you can import your HTML into the system, or create your email using the editor. Why must I define the sender’s physical address into the system? This is one of the requirements, based on the industry’s best practices. How long does it will take to broadcast a campaign? Most campaigns will be sent out in 10 to 15 minutes unless the campaign requires administrative approval. Campaigns may require administrative approval if they are sent by new users, have a chance to be flagged as spam or have other issues. If administrative approval is required, the campaign may take up to 24 hours to be sent. Will I lose email credits/contacts for test emails? No, you will not lose email credits/contacts for test emails by using the Test Send function. How many email campaigns can I create? You can create unlimited email campaigns and they will be stored in the system as long as you don’t delete it. Is there any expiry date for the campaign? No, there is no expiry date for the campaign and you can modify it anytime. Tracking reports on the number of people and their email addresses are available for: opening your emails, clicking into the hyperlinks within your campaign, emails that did not reach your recipients, unsubscribed emails. Can I schedule my reports to be sent to me? No, you cannot schedule any reports. You need to download the reports from the system. Are there examples or templates that I can use to build my forms? Yes, there are pre-created templates that you can use. Alternatively, you can also customise your own forms easily. How do I embed the form into my website? You can use one of the options - URL, Iframe or Portable HTML code to embed your form into your website. For example, if you are using Web Builder, you can embed the form using the portable HTML function. Can I send a thank you email after a form is submitted? Yes, you can send a thank-you email to the sender who just submitted the form. What is the Autoresponder feature? The Autoresponder feature allows you to pre-set processes to automatically interact with your subscribers. You can trigger the system to send an automated email based on pre-set criteria, such as, birthday greetings to your subscribers. How does it affect my credit limit? Please note that all automated emails sent will be counted as part of your credit/email subscription plan. Is there any limitations to the number of steps in an Autoresponder project? No, there is no limitations to the number of steps. Is there a storage limitation for my contact lists? No, there is no storage limitation for your contact lists. You can store as many contact lists as you want but the number of contacts/emails to be sent is limited based on your subscription plan. Can the system store duplicate records? Yes, the system can store duplicate records in the contact list but will only send out 1 email to 1 unique email address. Can I add new record to my existing list? Yes, you can add new record(s) to your existing list anytime. What is the difference between the credit and contact packs? Credit packs are limited by the number of emails that can be sent during a subscription cycle (1 month). A 10,000-credit pack allows a total of 10,000 emails to be sent. Contact packs are limited by the number of contacts that can be sent to during a subscription cycle (1 month). A 1,000-contact pack allows unlimited emails to a maximum of 1,000 unique contacts. I have unused credits/contacts for the month. Can I roll it over to the following month? No you cannot roll any balance credits/contacts to the following month. All credits/contacts will be reset based on the day of purchase. For example, if you purchase the pack on 15 Aug, the credits/contacts will be reset on 15 Sep.
Is there any impact to my contacts upon resetting the number of contacts in the following month? No, there is no impact to your contact lists. Your contact lists will remain in the system. The system will reset the count of contacts (email recipients) to send for the following month. Can I upgrade from one plan to another? Yes, you can upgrade from your plan to another easily. The upgrade will be effective immediately. The original plan will be charged pro-rated and the new plan will follow a new subscription cycle (1 month), starting from the day of upgrade. Can I switch from credit-based pack to contact-based pack or vice versa? Yes, you can switch from one plan type to another. Will the unused contacts/credits be brought forward when I upgrade to another plan? No, unused contacts/credits will not be brought forward to the new plan. No, the system does not support any downgrade of the plans. When I terminate my SimplyCast eMarketing and decide to re-subscribe later, will my data be preserved? Upon termination of SimplyCast eMarketing, the data will be removed permanently. When you re-subscribe, you will get a new SimplyCast eMarketing plan with no data. SimplyCast is a multi-channel marketing company with a web-based platform designed to create, track and deliver targeted online marketing campaigns such as email. SimplyCast is a leading provider of interactive marketing software and services for organizations worldwide. The company’s multi-channel marketing platform is a feature-rich solution used by thousands of customers in over 175 countries.